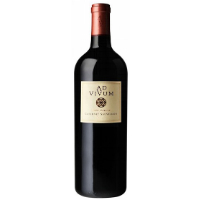 2009 Ad Vivum Cabernet Sauvignon is very opaque, with a deep ruby color and purple tinge. Layered aromas include generous cassis, super-ripe raspberry and black licorice, with notes of graphite and anise. These aromas are echoed on the wine's voluptuous palate. The wine coats the mouth with ripe, silky tannins, and hints of clove and pain grillé from well-integrated French oak follow throughout the long, enticing finish. Sumptuous upon release, yet properly cellared, the wine will continue to evolve gracefully until at least 2025.